Kimberly McCreight is coming out with a new book! & it’ll be released just in time for my birthday – 27 will definitely be a good year for me! I LOVE this and it literally made me laugh out loud (awkward when you’re in the middle of a bunch of strangers…) and it made me think of Lauren & her love of Goosebumps. This list of things only true book lovers understand is ON POINT. It’s long, but so worth the read! The only thing I disagree with is dog-earing pages.. I dog-ear all my (physical) books & there’s nothing wrong with that! Um, thank GOODNESS for this, and let the binge-watching begin! 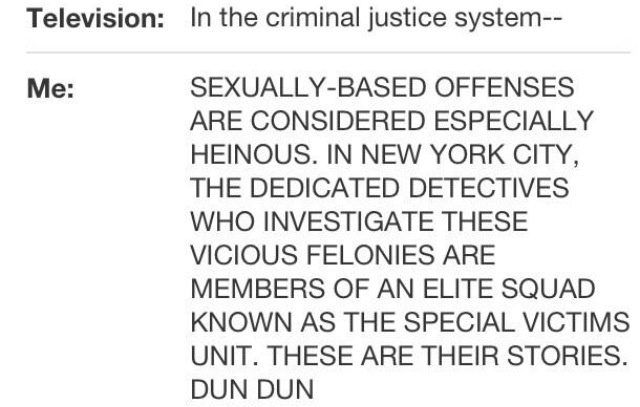 But really, I’ve seen every single episode of Law & Order: SVU and I’m sure it’s affected my outlook on sexual violence (among other issues) and I will forever love the show. On that same note, I’m totally reading the books on this list – and I’m sad I didn’t see it last year when it was first released! Totally not book related, but I’ve been a little bit obsessed with James Bay’s Let It Go. Does fiction based on fact have a responsibility to the truth? This New Yorker article discusses historical fiction and whether or not writers should keep facts in mind. I’m on the fence. I just finished Tiger Queens and some subtle things were changed and some characters were mashed together in order to make the story flow. If it makes a story make sense and flow better, I say stray from fact. I’m not reading historical fiction to learn history, I’m reading it to experience a story. I’ve been so worn out lately—I just want to stay home and introvert. Life is short, date a book nerd.